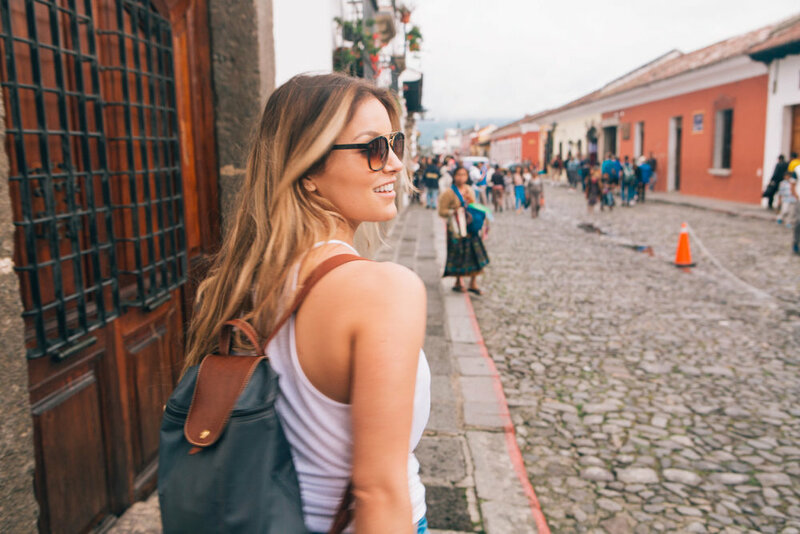 After an easy four hour red eye flight from LAX we arrived in Guatemala City and took a shuttle to our final destination; Antigua, a small tourist city located in the southern part of Guatemala. I couldn’t tell you how long the car ride was because I knocked out, mouth open, drool included. 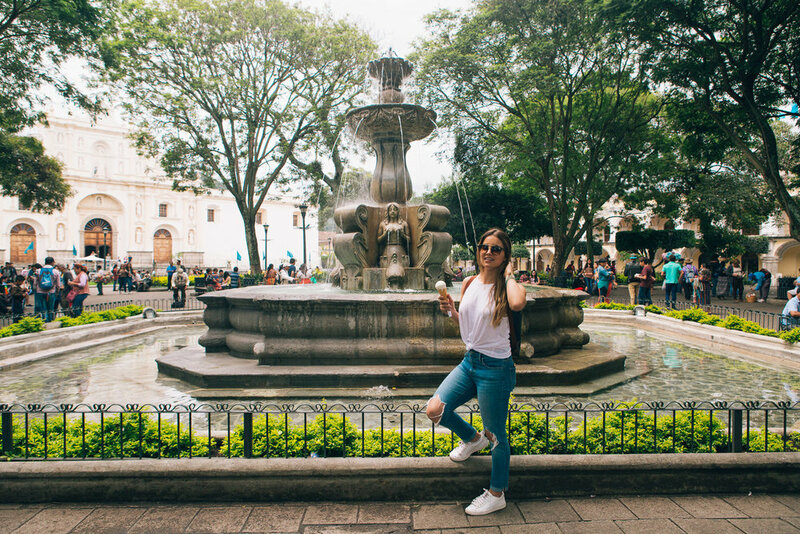 We checked-in to El Carmen suites, situated about four blocks from Parque Central. We had breakfast on the terrace of the hotel with views of the surrounding lush mountains as a light layer of fog covered their peaks. Antigua was already impressing me and I hadn’t even finished my poached huevos con fruta. Since our room wouldn’t be available for another six hours we reenergized with coffee and ventured into town. 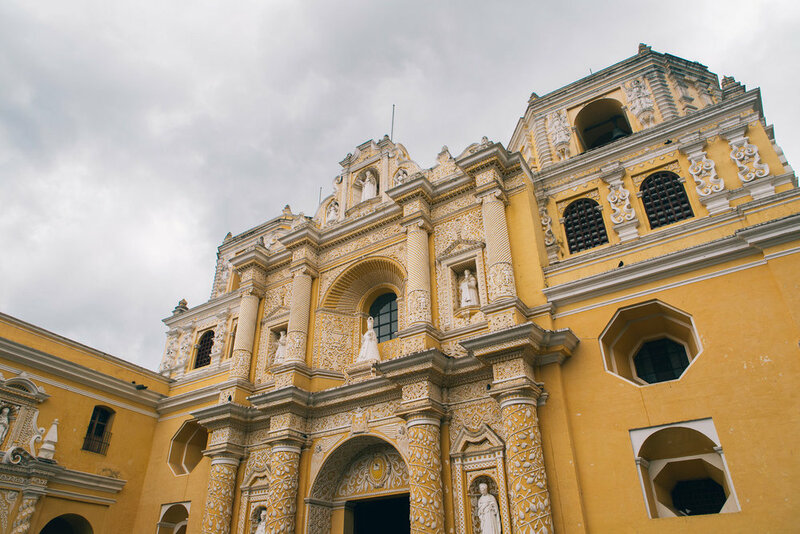 The architecture in Antigua could be described as colonial and quaint. It is a very small town and most of the main attractions can be walked in a couple of hours. At first glance it seems as though the streets are only lined with colorful walls and inconspicuous wooden doors leading to unknown places. The actual buildings are hidden behind these facades and this is where the true beauty of Antigua lies. 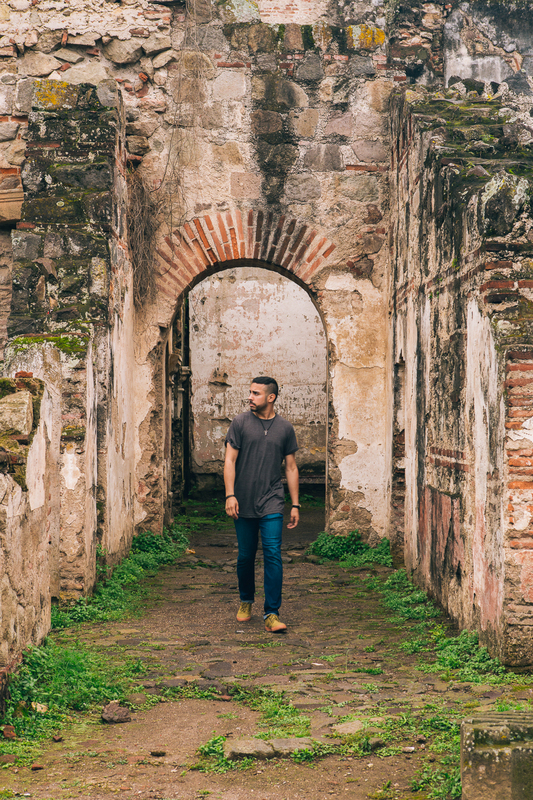 The discreet entrances often lead to courtyards filled with wall-climbing greenery, or a seating area for a coffee shop, or even a large space filled with vendors selling traditional Guatemalan goods such as embroidered shirts, handbags, and figurines. Not only is the use of space resourceful but the preservation of these colonial buildings is impressive. As we continued to walk aimlessly, we encountered old culture and new culture perfectly juxtaposed. 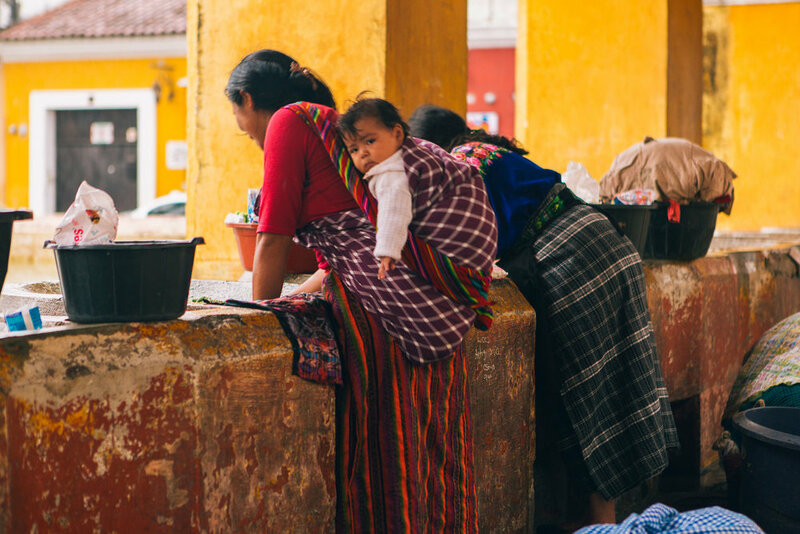 In front of Cathedral San Jose were two local women doing their laundry in the community pond, one with a baby strapped to her back. Much like the architecture, the beauty of the people requires a deeper look. While we only spent 48 hours in Antigua, my perspective of the local people was a very positive one. They are soft spoken, polite and genuine people and still deeply rooted in their cultural traditions. I noticed subtle characteristics. Things like when shopping for souvenirs, I was never persuaded or pushed to buy something. It was simply offered in a polite way and if I declined, my “no, gracias” was graciously accepted. We often stood in the middle of the streets as we snapped photos, to our surprise, drivers would come to a stop and wait patiently, avoiding intruding on our photos. Antigua was nothing like what I expected but, to me, this is what makes traveling so gratifying. You can have all these expectations in mind before arriving at a destination but in the most beautiful way, your expectations are over-matched. I think there are parallels to this in life also; if we allow ourselves to relinquish any expectations we have of a place, a person or perhaps ourselves we open our minds to something that could be far greater than what we ever imagined. Rainbow Cafe: Variety of healthy options and about $7-$10 per dish. Very cool artsy vibe with an open courtyard. Also, the waiters speak English. I got the chicken salad and it was filling and very fresh. Fat Cat Coffee: I prefer almond or soy milk in my coffee and this was the only place we found that offered it. A little pricey for Guatemalan standards at $4 for an almond milk latte, BUT it was delicious. Foreigner vibe with free wifi and a cool hangout spot. 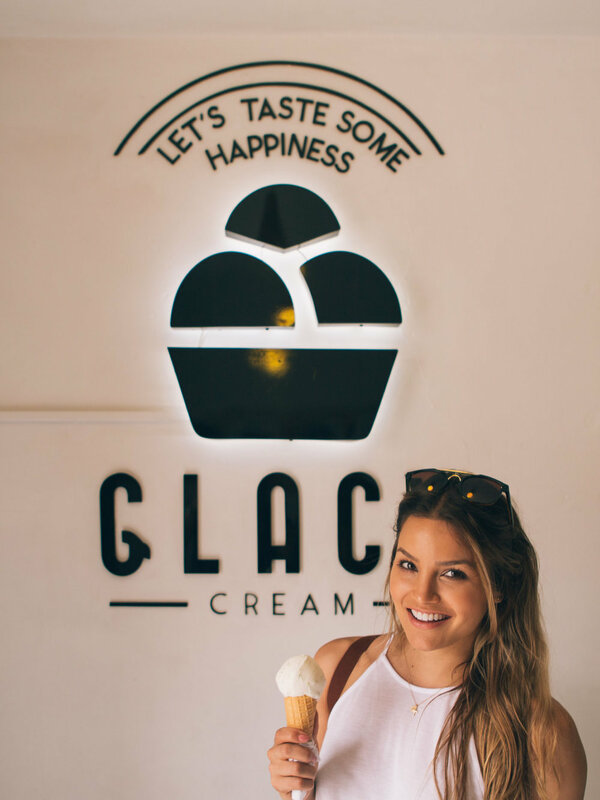 Glacy ice cream: Homemade ice cream, need I say more? Carry a rain jacket or umbrella with you at all times during rainy season (May-October). Don’t pay attention to weather forecasts, the weather has a mind of it’s own. Also, dress in layers. Prices for food or goods aren’t as cheap as you might expect. I spent about $30 a day on food and coffee. Wander around the streets, don't just stay in the main plaza area. We found some hidden gems when we wandered and never once did we feel unsafe. However, don’t flash valuables and be aware of your surroundings at all times. Bargain at the artisan markets!